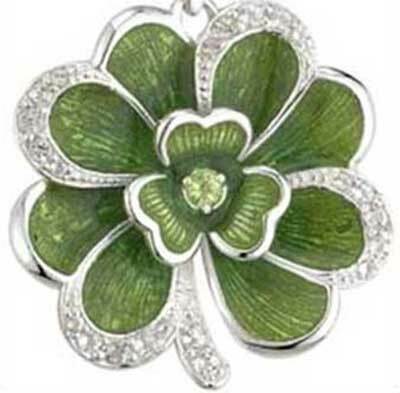 This shamrock bracelet has been hallmarked sterling silver by the Irish Assay Office at Dublin Castle in Ireland. 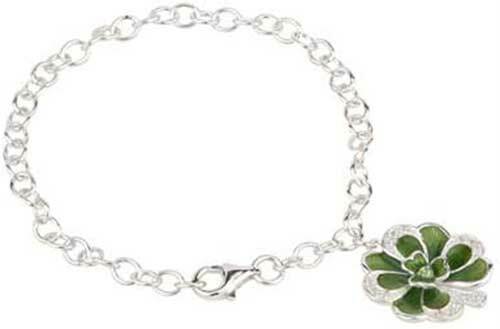 This sterling silver link bracelet features a large four leaf clover charm with a superimposed shamrock in the center. The 7 1/2" long Irish bracelet is enhanced with crystals and green enamel accents and the charm measures 7/8” wide. Both the sterling silver link bracelet and the clover charm have a lobster claw catch. The four leaf clover bracelet is crafted by Solvar Jewelry in Dublin, Ireland and it is gift boxed with a shamrock history card, complements of The Irish Gift House.